Cruz Explains The Left's Obsession With Ousting Trump. His Analysis Is Spot On. Texas Sen. Ted Cruz (R) appeared on CNN's "State of the Union" on Sunday to discuss the Mueller report. During his conversation with Dana Bash, Cruz brought up one very valid point: the Mueller report isn't the end of the Democrats' agenda to dismantle the Trump administration. This is only the beginning. 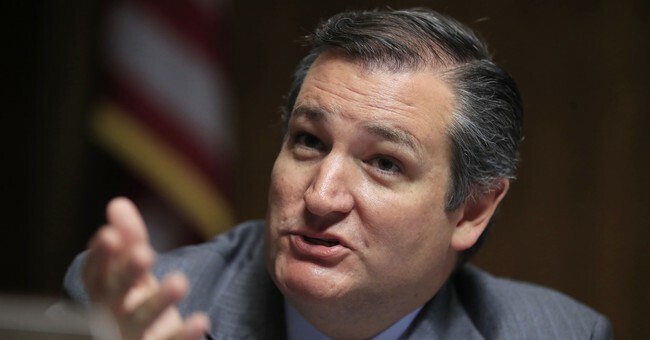 "If anyone thinks that the Mueller report being concluded is the end of the Democrats' attempt to take down President Trump, they haven't been paying attention the last two years," Cruz explained. Cruz pointed to an interview Bash conducted earlier in the show with House Judiciary Chairman Jerry Nadler (D-NY) as an example of what he was referring to. Nadler explained why Congress would be conducting further investigations into the alleged collusion between the Trump campaign and Russia. "Yesterday, the Mueller report was going to be the end all and be all. It was going to be the salvation for the Democrats and destroy President Trump. Now, you can already see the Democrats pivoting away and saying, 'Okay, we need to do other investigations. There's gotta be someone else. There's gotta be the Southern District of New York. It's gotta be the New York Attorney General. It's gotta be Congress.'" Bash didn't seem to agree with Cruz's analysis of the situation. "But Senator, it is the Justice Department. It's the president's Justice Department that is continuing to investigate those other things that I just mentioned," Bash explained. "Democrats are one thing but I'm talking about–" Bash interjected. Bash brought up that Mueller is not allowed to bring about indictments against Trump because of the Department of Justice's rules against indicting a sitting president. "But, Dana, my point is, you ask Congressman Nadler whether the House is going to impeach the president and I'll answer that for you. Yes. They fully intend to impeach the president and they don't care about the basis," Cruz explained. "Twice Congressman Nadler said something remarkable. He said, 'Listen, the special counsel's focused on crimes. We're not all that concerned with crimes. Our focus is – this is Democrats in the House – is much broader than crimes.' What they're basically saying is they're going to impeach the president for being Donald Trump and they don't care about the evidence, they don't care about the substance." "My point is the extreme left of the Democratic Party, they have so much anger and hatred directed at the president that we're going to see the Democrats move forward with impeachment, whatever the evidence, that's why you're seeing Democrats like Congressman Nadler say, 'Don't worry about crimes. Our focus is not on crimes. That's Bob Mueller's focus. Our focus is broader.' What their focus is is politics." For the last two years we have seen the Democrats do everything in their power to tear down the Trump administration. The Mueller report was supposed to confirm their suspicions that Trump colluded with Russia to influence the 2016 elections. We don't even know what's in the report yet and Democrats have already vowed to further investigate the matter because they say they "know" collusion transpired. Cruz is absolutely right. The House is going to move forward with impeachment proceedings, regardless of what is found. Just remember: we had freshman Congresswoman Rashida Tlaib (D-MI) talk about "impeaching that mother f**ker" on her very first day in Congress. Democrats won't be happy until Trump is no longer in office. And now their witch hunt will continue.